Sir Nicholas Alexander Faldo, MBE (born 18 July 1957) is an English professional golfer on the European Tour, now mainly an on-air golf analyst. A top player of his era, renowned for his single-minded dedication to the game, he was ranked No. 1 on the Official World Golf Ranking for a total of 97 weeks. His 40 professional wins include 30 victories on the European Tour and six major championships: three Open Championships (1987, 1990, 1992) and three Masters (1989, 1990, 1996). Born in Welwyn Garden City, Hertfordshire, England, Faldo "became hooked" on golf at the age of 14—having never "even picked up a golf club" himself, watching Jack Nicklaus play the 1971 Masters on his parent's "new colour" television (his very first exposure to the game). Just three years later, Faldo won the 1975 English Amateur and the British Youths Championship. Faldo describes his late discovery of golf enthusiastically, saying that he "love[d] school, until golf came along"—after which "the only thing [he] was interested in was getting out of the gates as quick as possible and going to the golf course." Faldo achieved instant European Tour successes, finishing eighth on the Order of Merit in 1977, and third in 1978; and winning a European Tour event in each of those seasons (in 1977, he became the then-youngest Ryder Cup player at the age of 20). Faldo continued his European Tour successes in the early-1980s, winning two consecutive Sun Alliance PGA Championship's in England, in 1980 and 1981. Faldo finished top of the Order of Merit in 1983, with five European Tour victories. Faldo won his second major championship at the 1989 Masters. Starting his fourth round five shots off the lead held by Ben Crenshaw, Faldo's final round of 65 (consisting of eight birdies, nine pars and one bogey) was the low round of the tournament and enabled him to get into a playoff with Scott Hoch. Displaying some brilliant putting in his final round, Faldo holed a 50-foot birdie putt on the first hole and followed this up with birdies on the 2nd, 4th and 7th holes. On the back nine, Faldo holed birdie putts of 12 feet at the 13th, 5 feet at the 14th, 15 feet (with an 8-foot break) at the 16th, and 30 feet at the 17th. In the sudden-death playoff Hoch missed a 2-foot par putt on the first playoff hole to win the tournament. On the 2nd playoff hole, amid the growing evening darkness, Faldo holed a 25-foot birdie putt to win the tournament. For much of the early 1990s, Faldo was considered the best golfer in the world. He spent a total of 97 weeks altogether at the top of the Official World Golf Ranking and his total of six professional major tournament wins were more than any other player in the world from 1987 through 1996. (Nick Price was second with three major victories during this period; Seve Ballesteros won five majors from 1979 to 1988). 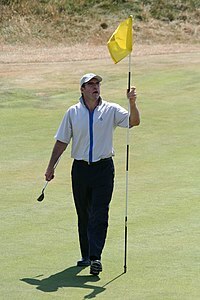 Faldo is the most successful Ryder Cup player ever, having won the most points of any player on either team (25) and having represented the European Team a record 11 times. He played a key role in making Europe competitive in the event. Having won 23 of his matches, lost 19, and halved 4, he also holds the record for having played the most Ryder Cup matches. After Faldo changed his swing in the mid-1980s, his methodical style gave him a reputation for being one of the game's more conservative players. However, Faldo did shoot some spectacular rounds of golf at the height of his career. For three consecutive Open Championships between 1992 and 1994, Faldo carded one round of less than 65 strokes in each of the three Opens, shooting a 64 at Muirfield in 1992, a 63 at Royal St George's in 1993, and a 64 at Turnberry in 1994. Faldo had made a bold move to pick Ian Poulter as his wild card ahead of the much favoured Darren Clarke who already had two tour victories that season including the KLM Open just two weeks prior to the captain's picks being announced. This decision, questioned by many, paid off when Poulter emerged as the top scorer in the tournament. Faldo had a very erratic relationship with the media prior to and during the competition. It was suggested by some journalists that Faldo's actions lost himself considerable credibility. During practice, photographers had taken pictures of him holding a list of players' initials, seemingly outlining the partnerships for the coming days. In the following press conference, he denied the list had any part in his tactics, and claimed it was a list of the players' sandwich orders. This was met with extreme skepticism from the media, which notably irritated Faldo when he was asked continuing questions about it. Faldo eventually admitted they were in fact possible player pairings and he'd been "caught out". Faldo controversially decided to play Sergio García and Lee Westwood, the two most successful Ryder Cup players on his team, for only one session on the Saturday. His team selection was vindicated, however, as Europe finished the day 1 point ahead, closing the gap to 2 points behind the USA. On the final day of the competition, Faldo decided to play a "bottom-heavy" tactic, where the best players would start lower down the order; thus, if it went to a close finish, Europe would have its best players in play. This tactic seemed to backfire, as the USA, leading by 2 at the start of the day, gained the 5 points they required by the eighth match rendering the last four irrelevant. This led to some severe criticism of Faldo's strategic skills. Faldo's cause was not helped by the poor performances of the three most experienced players on the European side, Lee Westwood, Sergio García, and Pádraig Harrington, who failed to win a single match between them. Lee Westwood later criticised Faldo's decision to tell him he wouldn't be playing in the morning foursomes halfway through his afternoon fourballs match on Friday. Faldo's decision to only appoint one vice-captain, instead of the usual four or five, was also met with doubts about his ability to know what was going on in all the matches being played simultaneously. Faldo was accused by the media of being a "loner" and a "control freak", thus also contributing to the team's failings. In an interview with the British Daily Mail newspaper in 2012, Faldo said of his Ryder Cup captaincy: "The bottom line is that it was a tough experience and very tough for me to deal with afterwards." The Daily Mail described Europe's 2008 Ryder Cup defeat as "a calamitous loss". On 3 October 2006, it was announced that Faldo had signed a contract with CBS to replace Lanny Wadkins as the network's lead golf analyst. "I view this as a fabulous opportunity for me, which may come once every 10 years. But it will seriously curtail my playing career. My playing days aren't completely over but my priority now is given to CBS." Faldo's decision meant he missed the 2007 Masters, an event he had won three times. In 2007 he also became the lead analyst for Golf Channel's coverage on the PGA Tour. Faldo has garnered less positive support since he began working on his own. He and Azinger did have a pair of reunion telecasts, one for each of the analysts' employers. Faldo joined Azinger and Tirico on ABC for the 2007 Open Championship. Meanwhile, Azinger joined Faldo and Brian Hammons on Golf Channel for the 2009 Presidents Cup. In 1991, Faldo launched his golf course design practice Faldo Design, which has designed or remodelled dozens of courses spread across several continents. Designs include Elea Estate(Paphos, Cyprus), Laguna Lang Co (Hue, Vietnam), Chart Hills Golf Club (Kent, England), Sporting Club Berlin, Cottonwood Hills near Hutchinson, Kansas, and the Wadi course (now named The Faldo) at Emirates Golf Club, Dubai. Faldo will be designing a championship golf course and a golf academy at Lavasa, India. As a way of opening his first course design in the UK (Chart Hills in Kent), Faldo teed up on the dog-leg right par five. He drove into the middle-right of the fairway, he then teed another ball and drove off, the two balls finished within 6 inches of each other and to this day can be seen set into the fairway in a protective case. This was a mark of the man's golfing ability at his peak. Faldo also worked on several overseas golf courses like The Fortress at Louisbourg Resort Golf & Spa on Cape Breton Island, Canada. Most recently, he designed a world-class course in San Miguel de Allende, México. Ventanas de San Miguel hosts an 18-hole par-70 course that was opened in late 2010. He has other business interests including coaching schools and pro shops. In 1996 he launched the Faldo Series to provide opportunities to young golfers under the age of 21 from around the world both male and female. There are over 7,000 participants each year and there are 38 tournaments in 28 different countries. Age category winners at each event qualify for either the Faldo Series Grand Final, hosted each year by Faldo at the Lough Erne Golf Resort, Northern Ireland or the Faldo Series Asia Grand Final, also hosted by Faldo at Mission Hills Golf Club, Shenzen, China (A Faldo Design course). The registered charity boasts a number of successful graduates, the most notable being; Rory McIlroy, Yani Tseng, and Nick Dougherty. Along with the Marriott hotel chain, Faldo established The Faldo Golf Institute in 1997. This is a golf instructional program designed to help golfers of every level improve their skills and enjoyment of golf. The Institute has five locations: Orlando, Florida; Atlantic City, New Jersey; Palm Desert, California; Marco Island, Florida; and Hertfordshire, UK. In 2007, Mercedes-Benz tapped Faldo to act as brand ambassador, to promote the revival of the Maybach brand of ultra-luxury automobiles. Faldo was voted BBC Sports Personality of the Year in 1989 and inducted into the World Golf Hall of Fame in 1997. In 2000, Faldo was ranked 18th greatest golfer of all time by Golf Digestmagazine. Faldo met his first wife, Melanie Rockall, when he was 21. They married in 1979, but less than five years later they parted when she discovered he was having an affair with his manager's secretary, Gill Bennett. Faldo later said of his relationship with Rockall: "We were happily married for eight months. Unfortunately, we were married for four-and-a-half years." Faldo's divorce from Rockall came before his major championship successes, and her settlement was relatively small. He married Bennett in 1986, and the couple had three children: Natalie, Matthew, and Georgia. When Faldo moved to America in 1995 to play full-time on the PGA tour, Bennett stayed at home in England and the marriage ended later that year after Faldo began a relationship with 20-year-old American golfing student Brenna Cepelak. Gill Bennett later revealed that the births of their three children had been induced to avoid any clashes with Faldo's playing schedule. She said of Faldo: "Socially, he was a 24-handicapper." Faldo's three-year affair with Cepelak ended when he met Valerie Bercher. The spurned Cepelak famously battered Faldo's Porsche 959 with a golf club, reportedly causing damage of £10,000. Faldo's relationship with Bercher, a Swiss PR agent, began in 1998 when they met at the European Masters golf tournament. At the time, Bercher was working for marketing company IMG. She left her fiance Olivier Delaloye and married Faldo in July 2001 in a lavish ceremony at his Windsor home. They have a daughter Emma Scarlet (born 2003). It was announced in May 2006 that Faldo had filed for divorce. According to the Sunday Times Rich List, Faldo has a net worth of £34 million as of May 2012. He is a supporter of the Conservative Party.